Canadiandollarbingo takes you to the Indy Race! For the third year, CanadianDollarBingo is hosting its popular Indy Bingo Contest where players will be participating for a chance at over $60,000 in cash and a trip for two the beautiful city of Toronto this July 2017 to witness the real deal. 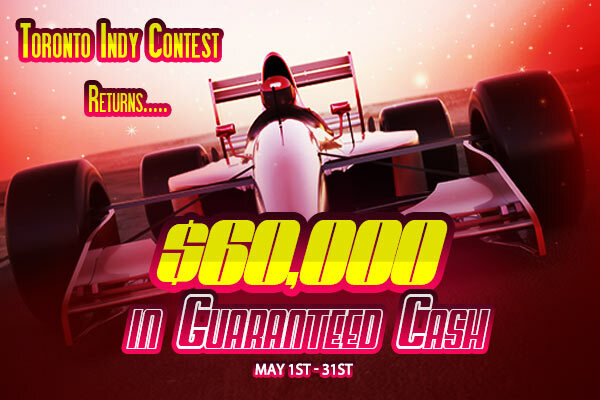 Head over to CanadianDollarBingo’s Main Bingo Room every day from 9:00am to 11:00pm to win your share of $60,000 in cash and a chance for you and friend to flight to Toronto for the Indy with two nights’ accommodations at a beautiful downtown hotel in Toronto and $500 in spending money. Players at CanadianDollarBingo are all trying to win the most entries by playing the special contest Indy bingo patterns. The more entries players get, the bigger the chances of winning the Grand Prize Draw. This entry was posted in Blog on May 10, 2017 by Canadian Dollar Bingo.